Earl Grey Eggnog? Usually I'm a purist when it comes to eggnog (refuse to even try additions like pumpkin or chocolate), but this week I thought I'd shake things up a bit and combine two of my favorite beverages, tea and eggnog. I’m a firm believer that people who say they don’t like eggnog have just never had good eggnog. Eggnog without eggs doesn’t count (unless you’re vegan or allergic to eggs, of course). And eggnog with raw eggs just isn’t happening around here. Besides the concerns about salmonella, there is the fact that the taste and texture aren’t quite as good (IMHO) as in an eggnog made with a cooked base. 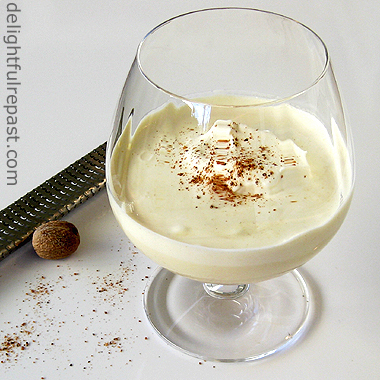 If you’re not interested in messing with the classics, try my usual Classic Eggnog. But I was feeling wild and crazy this week and thought I’d throw one of my favorite teas into the pot and see what happened. With just 1 teaspoon of sugar per 1/2-cup serving, it has far less sugar than is typical; but you won't miss it, I promise. And I use just enough brandy for great flavor, about 1/2 teaspoon per 1/2-cup serving; but you can leave it out altogether if you like. Are you an eggnog fan? If not, maybe this is the year to try it my way! Or at least try Eggnog Ice Cream! 1 At least 9, or up to 24, hours before serving time: In 1-quart saucepan, stir the tea into the hot milk, cover and steep for 10 minutes; strain the tea. In bottom pan of double boiler, heat an inch of water to a gentle simmer. In top pan of double boiler, whisk together egg yolks, sugar and salt until well blended. 2 Gradually whisk in the tea-infused warm milk and cook over hot but not boiling water, stirring constantly, until mixture begins to thicken slightly and registers between 160F/71C and 170F/76C (but do not boil) on an instant-read thermometer. * Just pull a tall stool up to the stove like I do 'cause it's gonna take a while, perhaps 10 minutes. 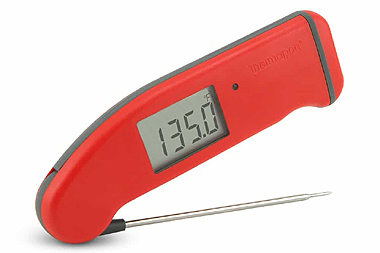 * I have the Thermapen Mk4 now, but I used to have the Classic Super-Fast Thermapen and it’s fabulous as well. You don’t want the eggs to curdle on you while you’re messing about with a slow thermometer! 3 Stir in the cold milk. Strain custard into a 2-quart bowl; stir in brandy* or rum, vanilla and nutmeg. Cover and refrigerate until well chilled, at least 8 hours. * Actually, you could leave out the alcohol and let each person add his own favorite tipple or have it alcohol-free. I just use 3 tablespoons of brandy as a flavoring. 4 To serve: Whip cream just until soft peaks form. With wire whisk, gently fold whipped cream into custard. 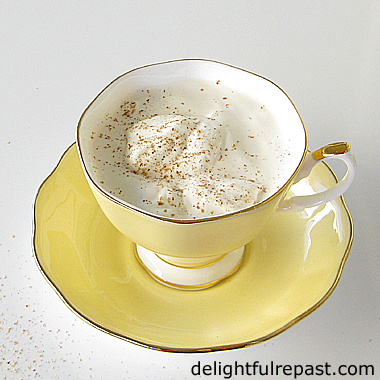 Pour eggnog into chilled 2- or 2.5-quart punch bowl or pitcher; sprinkle with nutmeg. That's a fun twist and looks really tempting too, Jean. Thanks, Angie. We went through that batch too fast - must make another! Agreed, agreed. Never is the line between good and bad so clear as it is with eggnog! Never can figure out just where good eggnog goes bad, but I think it has something to do with the vanilla. I love vanilla, but it must be a soft accent. Tastes horrible in excess. Success is no excess! Mrs Mummy, thank you! I do hope you'll whip up a batch for friends (you'll be a hero!) and try a little sip yourself. You might be surprised. Sully, I so agree. So many people overdo the vanilla in lots of things. And too much, especially if it's the imitation stuff, is not good. More is not always better when it comes to flavors. Subtlety is the thing. OOOOhhhhh - thanks, Jean - I am soooo going to try this! I'm having a few gatherings next week, maybe have to whip up a batch for at least one of them. Thank you for sharing. Hugs! Thanks, Michele, I hope you will. I think you'll really like it. I like your attitude, Mrs Shoes - "you'll drink it the way I made it or you won't get any." It CAN get a little ridiculous when we try to make multiple versions of too many things on the menu, trying to please everyone! Thanks, CIMT! I've never tried it "flavored" with Jim Beam, but I've heard it's pretty tasty. I agree with Mrs. Mummy Harris,I am only thinking about to try it after your delightful post and wonderful tea cup!Hugs! Thank you, Maristella! Do give it a try - and let me know how you liked it! Hugs. Oh my goodness, Jean, your Earl Grey Eggnog sounds delightful indeed! What a wonderful combination. Thank you for sharing what is sure to become a new Christmas classic at our house with us at the Hearth and Soul Link Party. I hope you are enjoying the run up to the holidays! April, thank you so much. I hope you'll try it soon and let me know how you liked it! I just want you to know that this could really be big trouble! What an interesting combo! I just received a box of Twinings Earl Grey tea for Christmas so now I just need the eggnog. I also recently enjoyed a yummy rum and eggnog ice cream made by a local ice cream company. Margie, I always put brandy in my eggnog and eggnog ice cream, but I know rum is good too. I think you'll like the Earl Grey with the eggnog. Let me know. This sounds so delicious! I like the idea of eggnog, but the cartons at the store leave me gagging. I'm going to try this recipe, and my husband will be thrilled! Lorrie, thank you so much! I hope you both like it as much as we do! I don't like those store-bought eggnogs either. Thanks, Jean - I will definitely give this recipe a try this holiday season. I will let you know how it turns out! Thanks, RR. I always enjoy hearing how one of my recipes turns out! Synergies between different cultures producing new music, art, writing, food and drinks is so important. The sciences benefit greatly from synergies. You can think of human interactions as creating beneficial synergies. "Earl Grey Eggnog,"??? What would the 2nd Earl make of that? Ha! Ha! I like your creativity, Jean. I must admit I have never had an eggnog. Thanks, Leanne. I love my classic eggnog, too. AND meringues and pavlovas, IF they are not too sweet! Tony, never had eggnog? That's shocking. Do give it a try! Hi Jean! I'm an eggnog lover, and your twist with the tea sounds delish! I wish I could share a sip of yours while we talk tea, and baking! How fun that would be, Kitty! I only just learned, from your last post, that you were a home ec teacher - I'd love to hear more about that. How intriguing, Jean! I didn't grow up with Egg Nog (I don't think it's as popular across the Pond) but I'm a huge fan of anything involving Earl Grey tea. Thank you! Thank you, Pauline! I hope you'll give this one a try - it's positively addicting! 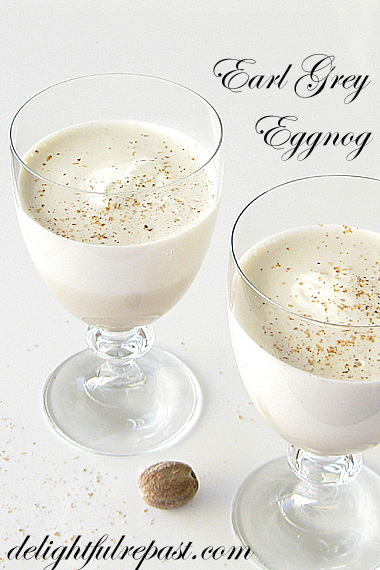 I am one of those weird people who actually loves eggnog -- this looks like a fun way to give it a little 'twist'. That is a delightful twist but I am a bit afraid to drink raw egg. I am not a big eggnog fan but I think I would like yours. Happy Holidays to you. I am not a big eggnog fan but I think I would like yours, Happy holidays to you and your family. Thanks, Elise, but there is no raw egg in my nog! I don't consume raw raw eggs either. Karen, thank you. How exciting - not just one, but two grands! Hope she enjoys the alcohol-free eggnog. Happy December! I confess that eggnog is a bit of a mystery to me. I've tried one or two eggnogs in the past and I'm willing to believe that they weren't good examples. I love the idea of this recipe - it sounds delicious but I've suggested trying to make our own eggnog and the reaction in my house was so negative that I've been told I must go to the bottom of the garden if I want to try such experiments. That may not stop me if the weather gets a bit better. Too funny, Phil! But, really, if others in the house don't object to custard, they shouldn't insist on your going to the bottom of the garden to make eggnog! :D Send anyone in the house out on an errand for an hour and make the eggnog. Once they try it, they'll be begging you to make it again! A little late on comment this week...Christmas happens! Something I hadn’t seen before. Have posted it on my Facebook page for Antiques And Teacups too! Thanks for linking to Tuesday Cuppa Tea and have a lovely week! Not being a tea drinker, I would probably opt for your classic! Markipedia, however, woullove this! Ruth, thank you. Social media shares are always much appreciated, as is Tuesday Cuppa Tea! Thanks, David. But how can you not be a tea drinker?! That's okay. Glad Markipedia is! Yep. You make everything sound good Jean! No I am not a lover of egg nog...but I wasn't a lover of nutmeg in anything until you introduced me to freshly grated nutmeg in ice cream--and I'm sold on it! Yes, egg nog ice cream is probably in the future for Christmas. Thanks, Sue! I haven't made my eggnog ice cream in a long time - must make some this week. Just think of the eggnog as liquid ice cream! Dawn, thank you. Hope you'll try it soon. Love the #DreamTeam. Happy December! What a festive and delicious drink for the holidays! Hope you have a fantastic week and thanks so much for sharing with Full Plate Thursday. Thanks so much, Miz Helen! Happy December! Hi again, Jean! I'll be featuring your post at the Hearth and Soul Link Party later this week. Merry Christmas! April, thank you so much! Sooo appreciated! The loose tea stays in? If so, are the tea bags to be cut open and dumped in? Kind of surprised I didn't see this question in the earlier comments. Sounds delicious though -- I've been looking for a good 'from scratch' recipe. Mel, good catch! Can't believe I left out the straining step! I've now added it, thanks to your keen eye. Let me know how it turns out for you. Tea? What a neat idea! Never thought to use it in eggnog. Early Grey is a particularly nice taste -- love its flavor. Thanks! Thanks, KR. I've put Earl Grey into just about everything I can think of! Good stuff! Oh my....that looks so delicious! You never disappoint Jean! Thanks for sharing. Oh, Bernideen! Thank you so much! I'm an Earl Grey gal so this sounds like my cup of nog. It looks beautiful. Happy Holidays, dear Jean. Thank you, Amalia. Happy winter! I would agree, chickenruby, if it was simply combining brewed tea and eggnog. But when the tea leaves are steeped in the hot milk (no water involved) it's somehow different. But I understand completely! :D Thank you. I made a double batch of your eggnog this year (of course!) and it was a hit as usual! I missed this recipe till now but might have to give it a try next year. I love earl grey tea and the combination sounds intriguing. Happy new year Jean! Richard, thank you so much. I'm so glad you like my eggnog! Maybe you can give a single batch of the Earl Grey Eggnog a trial run before next year's Eggnog Season? Hope you have a wonderful 2018! Thanks, Clairejustine! I hope you'll try it soon! I have never had eggnog - ever! Thanks for joining in at #TriumphantTales, we are back on Tuesday, hope to see you there! Jaki, you must try it and let me know how you like it! See you Tuesday.